Unfortunately, I was only able to work a few hours on this contest. 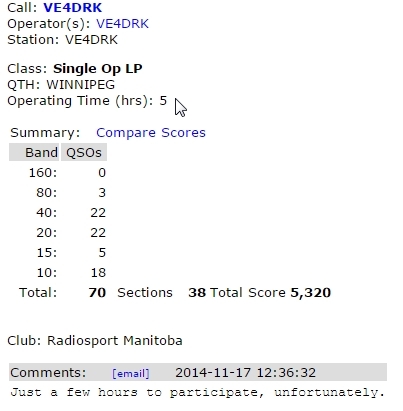 This time I was at my own QTH on my own rigs. After running on Cary VE4EA’s equipment for a while I get a little spoiled, so I started to work on the gear and bring it up to speed to run on a contest. I did S&P for a while and, man, was it tough — I mean the exchange seemed so slow, it took, like, forever, to get to another exchange. Oh well — something to learn from and get better at.